Christmas by the coast is surprisingly good for the soul. Seasonal decorations fill the gaps left by the off season and the constant presence of a crashing sea reminding you of a pernicious uncaring god makes you hug a little tighter, drink a little quicker, and dance a little longer. The scandiwegiegns may have invented ‘hygge’ as a concept for the warm coziness and drowsy contentment of being warm inside while the winter smashes around you, but I live on the heroin coast and in the prescription painkiller capital of England – we really made it our own. 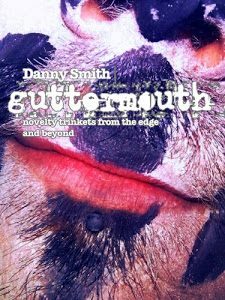 Guttermouth: Novelty Trinkets From The Edge And Beyond ebook: Five years of foul mouth observation and booze-fuelled nihilism by Danny. A collection of a confused man trying to find meaning in a world I abandoned as rational a long time before. The best of a full half a decade of blog posts, magazine articles, interviews reviews and columns. Guttermouth is a meaty 47,000 word e-book, a resignation letter to reality, and possibly future evidence for the prosecution. 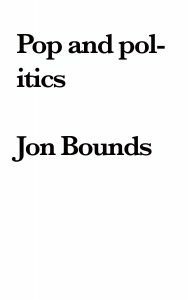 Pop and Politics ebook – No embarrassment, no excuses, just mix of pop and politics, written by Jon over the last couple of years. Includes interviews with the Lilac Time’s Stephen Duffy, Peter Hook, David Shrigley and MP Tom Watson. 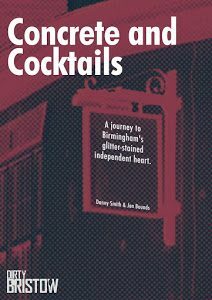 Concrete and Cocktails: a journey to Birmingham’s glitter-stained independent heart ebook: Danny and Jon’s sort of prequel to Pier Review, where they journeyed around just the pubs of their home town. Can you drink in all of Birmingham’s independent hostelries in one day? Yes of course, although it might not be sensible. An unchained psychogeographic adventure. An actual postcard, if you send us your address. Maybe a badge if you’re on the ‘nice’ list. Maybe some other stuff we find lying around our hard drives. Offer applies til the end of December only. Send receipts or screen caps to – jonanddan@pierreview.co.uk or Tweet us a pic @pierreview and we’ll ping you with download links. from Amazon in paperback and on Kindle. And on iBooks and from independent bookshops. Do you know how the Isle of Man voted in the EU referendum? Do you know how the people of the – unfairly stereotyped as — backward island in the Irish sea felt? You may guess, but do you actually know? No, and neither do they: they weren’t allowed a vote. That’s something we discovered when we visited to talk about the book, and visit their pier a week or so ago. There’s something about visiting places that are a little out-of-the-way to make you look back at your country with fresh eyes. Counting up another 80,000 people disenfranchised by the government was another scale that fell. We’ve mused a lot about ‘Englishness’ over the last couple of years, and it’s disconcerting that as we’ve been able to understand a little more about what it means to us (and it’s a complex and cloudy beast, a mirror best approached from the side unless you want a shock), lots of other people have thinking too. They are surer, more forceful and as often with the confident and loud; wholly and widely wrong. Holiday Dad is normal Dad, but with the faders all set differently. Freed from the routine of work he can indulge his passions: reading the paper, finding the cheapest bar, moving his bowels. Or maybe your dad really loved putting up windbreaks as well as breaking wind. Despite the cultural hangover of being the main breadwinner, dads seem to understand that the holiday isn’t really for them, it’s just an opportunity to dad in a different place. And maybe, if he’s very lucky, he’ll get to play darts against Bobby George in an exhibition match on a wet Wednesday afternoon in the Pontins bar. 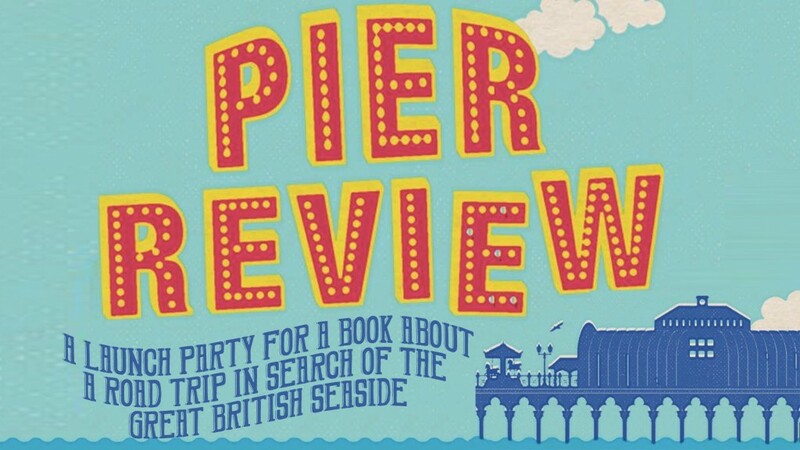 Pier Review is a book about memory as much as it is about piers, maybe more so. Our dads are of course featured. The whole way down the motorway my memory is jogged by certain vistas and road angles, including the moment the motorway splits and winds around a sheer drop to the right. I remember it because without fail this would be the point where my mother would freak out because she’s scared of heights, and my dad would plaintively explain that short of taking a 20-mile diversion this was the only way they could go. Looking back I’m sure there was the hint of a smile on my dad’s face. The thing is, when you separate yourself from your normal rhythms and routines for long enough, your brain retracts and waits for more information, waiting to find the routine again. Even on holiday you quickly fall into a different routine: your dad will get up way before you to go for a walk and ‘get the papers’ and then berate you for sleeping in and ‘missing the best part of the day’. Little does he know that sleeping is for you, the teenager, the best part of the day for exactly the same reason his early-morning jaunt to the shop is for him: you don’t have to interact with your family in any way. 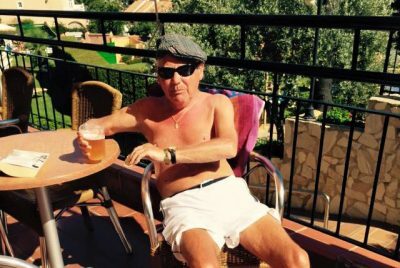 So here’s some revenge, here are our favourite Holiday Dad snaps, showing our dads in classic Holiday Dad action. Jon’s Holiday Dad knows the importance of keeping your head covered. And your liver under pressure. Tweet us yours or your tales with #HolidayDad and we might find a free gift or two for our faves. 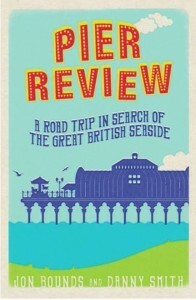 Pier Review would make a fantastic present for Father’s Day (19 June), by the way. Keri Davies, writer of The Archers called it “a lovely book, laddish but lyrical“. “Sorry but I found this book extremely puerile and would not have bought it, had I realised the bad language in it. 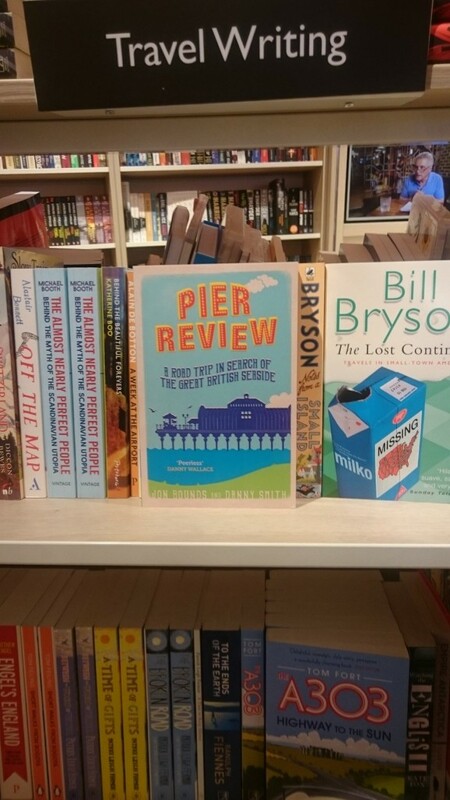 I am a great Pier enthusiast, but was disappointed as there’s not a single picture of these wonderful piers!”. No photos, some bad language (although not as much as there was before the publishers got hold of it): perfect for dads. Buy now in the shops, from Amazon in hardback, in paperback and on Kindle. Also on iBooks and from good independent bookshops. Order now, and if you read quickly and don’t break the spine it will still be a good Father’s Day present in a week. Our trip was not just around the country, it was through our cultural heroes and experiences too. Victoria Wood came up a lot – and not just because half-way round visiting all those piers we found out that her brother Chris had beaten us to it. We hated him for it. Victoria Wood’s humour is deeply ingrained into our world. Jon has a Platonic ideal of one of her sketches in his head, which involves simply pushing a trolley round a supermarket and saying the brand names out loud – only the ones she’d pick as perfectly comic and culturally representative. It’s not funny when he does it, but it didn’t stop him doing it every time we went to buy anything. And because our maps of the world exist in an ideaspace, these heroes can come to the fore at any time: accessed through the most simple or tangential of connections. A name, a word, or both. And those connections can save you, they mean a lot. Did you know that after seven on a Thursday every local BBC radio station transmits a show that has the best of all of the BBC local radio stations. Radio eats itself. 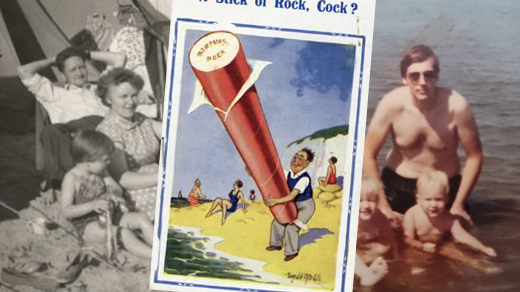 But don’t think about the homogenisation of British culture, think about the piers. This week Cleethorpes was voted pier of the year, and Hastings pier was re-opened by local boy Suggs from Madness. The Mark Forrest show had Suggs on Hastings pier, lots of Cleethorpes locals not being at all interested in their pier — and then me talking about piers in general. We were on our local BBC station BBC WM’s breakfast show last week with Adrian Goldberg. You can listen here. In more Birmingham, we’re appearing at Ignite Brum — a night of talks at the Glee Club this Wednesday, tickets are free. 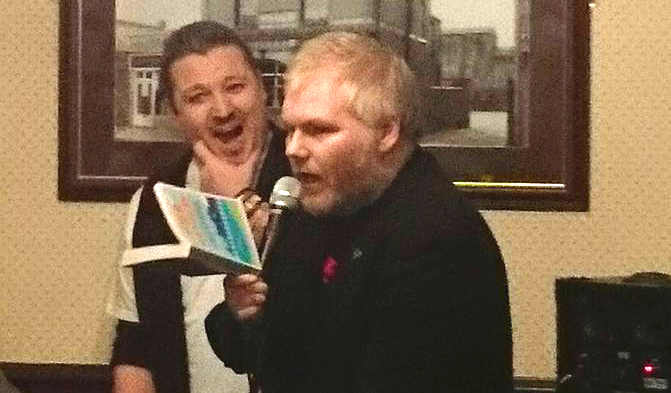 We survived the nerves to launch the book, as you can see from the picture. We really had a lovely time and hope everyone who came enjoyed it — and those that took a book away with them, we hope you enjoy that too. Thanks especially to Libby and Caroline, who amongst other things put together a fabulous quiz about piers — that we almost came first in, almost. So what next? 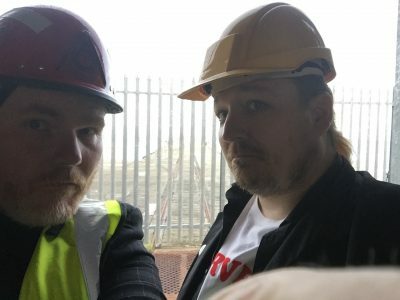 Well, we’ve a good few bits of publicity to do: including an appearance at Ignite Birmingham in a week or so and we’ll hopefully see a few reviews in the media. We’ve already had a few on Amazon, and you wouldn’t believe just how much that helps: so if you want to add one that would be smashing. If you’re interested in how the book became a book, from the first idea to publication, then we’ve written quite a mammoth article about that over on Medium which you may like. If you’d rather something quicker, there’s a run through of the oddest things we saw on our trip, on Buzzfeed, where you’ll also find a quiz about checking your pier experience — how many have you visited? 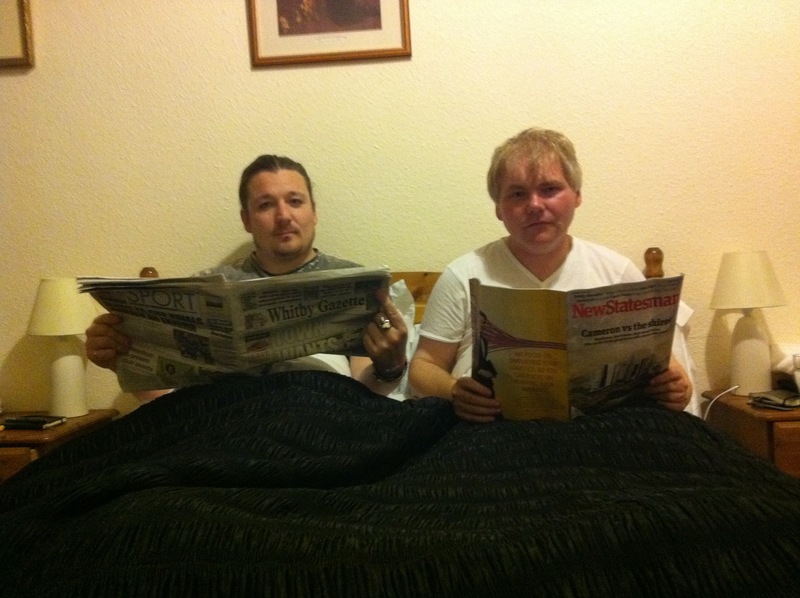 We’ve also written a piece for Area, and Danny has been interviewed, and both Dan and Jon have written other little bits. And if you’re reading the book now — why not try our ‘soundtrack LP’ which is over on spotify, all the music we were listing to on the way round the coast and all that which is mentioned in the book. And, it is in the shops. We’ve seen evidence. You know at the start of Goodfellas when Henry Hill says “as far back as I can remember, I always wanted to be a gangster” – well it’s like that with us and running the entertainment at a holiday camp in the ‘50s. Do it before 12 noon on 12 Feb. The top three, as judged by us, will win a copy of Pier Review. We’ll share all the entries here. 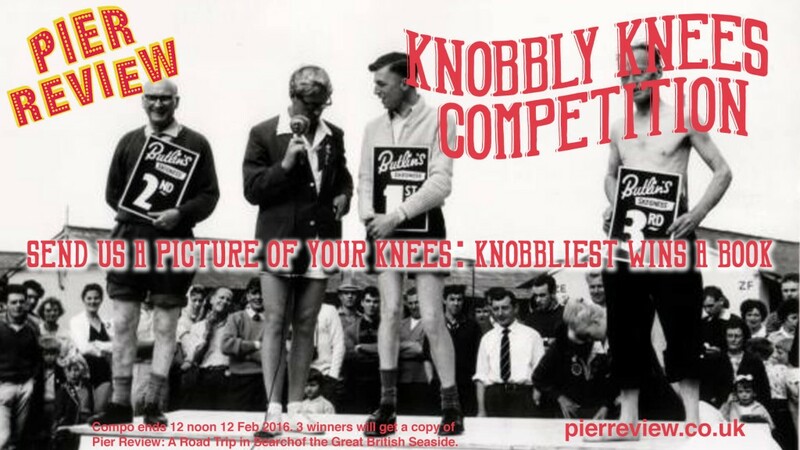 By the way, have you noticed the third prize winner here isn’t even showing his knees? You have do, get rolling those trousers. 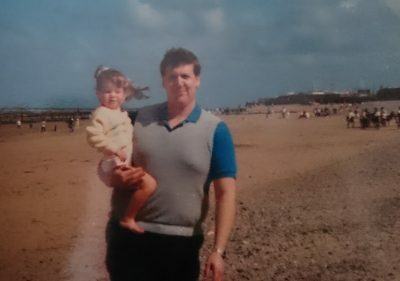 *Danny even won the ‘Prince of the Camp’ competition at Southport Pontins in 1988. Join us to celebrate the launch of a book that has been five years, fifty plus piers and two thousand miles in making. 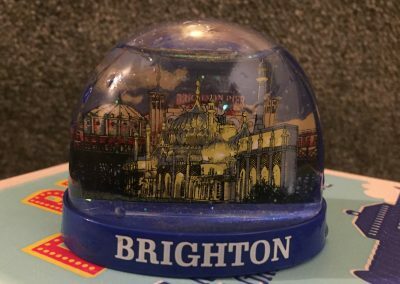 We’ll have a short reading or two, a chance to prove that you are Pier Masters in our quiz, maybe Punch and Judy, all the fun of the seaside that can be shoehorned into a pub in the second city. And there will be drink. Craft beer drink, if that’s the sort of thing that you like. From 7pm Friday 12 February at The Woodman, The Woodman, New Canal Street, Birmingham, B5 5LG – Just by Curzon St station. RSVP on our Facebook event if you so wish, here. 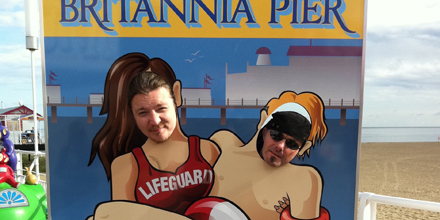 You stick your head through and get a photo taken, if there’s one thing that’s everywhere at the seaside it the sea. But also these. But they don’t have a proper name. A few questions on the internet and a bit of googling and we got a few options: Aunt Sally board, face in the hole board, character board, peep through board, cut-outs (which can’t work), and even the French word ‘tintamarresque’. The French have a word for it, and we don’t: it’s an insult to our national character. So, what should we do? Settle on one, pinch the French? If Pier Review can do one thing, it should do this service to the English language.